The most in-depth guide for goods and services in Jakarta. Categories range from arts and handicrafts to water systems. The guide includes contact information, business hours, and a description for each shop or service. The Jakarta Shopper's Guide uniquely showcases businesses and retailers recommended by expatriate clients and shoppers. 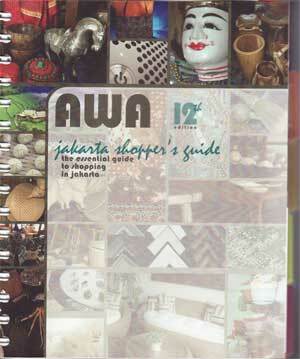 The first edition of the Jakarta Shopper’s Guide hit bookshelves over 30 years ago. It has been an indispensable guide for newcomers and long-term expats ever since. All entries in the book have been tested and approved by shoppers like you! Many listings indicate English-speaking shop assistance. If you are looking for a travel agent, bank, batik, air conditioner services, veterinarian, orthodontist, bottled water supplier, or more ... consult the Jakarta Shopper's Guide! Published by the American Women's Association of Indonesia, 2013. Proceeds from the sale of AWA publications benefit the AWA and its charities. AWA publications are sold at the American Women's Association Center. The AWA cannot ship books overseas; purchases are only accepted in Jakarta.